"Denham is back from shooting another picture, and this time he says he's got something the likes of which has never been seen before- King Kong, The Eighth Wonder of the World!" Who wouldn't recognize that iconic scene of a gaint gorilla on the Empire State Building, a screaming girl in his grip? King Kong tells the story of a movie production crew who sail to a Lost World-like jungle, where they enounter wonders undreamed of. A daring rescue mission must be performed to save the movie's leading lady after she is abducted by the natives, and later by Kong himself. But when all those who survive the terrors on the island are finally reunited, the director, Denham, proposes to capture this beast, and bring him to the pulsing heart of civilization- New York City. Everyone knows how that ends- with a tradegic fall from the (at the time's) world's tallest skyscraper, and the infamous last lines "It wasn't the airplanes. It was beauty killed the beast." King Kong stands as a landmark black and white film. Though hopelessly gawky and cumbersome its special effects may seem to some 21st century viewers, they were considered break-through in their day, and are still considered the roots of today's special effects technology But it isn't bad, watching these effects. 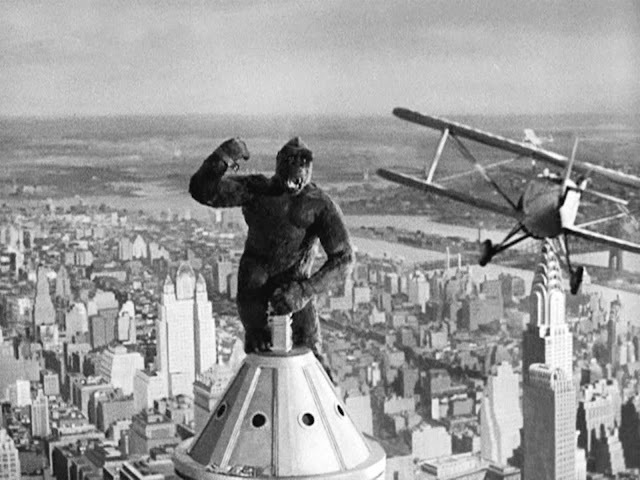 To the contrary, as Robert Egbert puts it "there is something ageless and primeval about King Kong that still somehow works." Plot-wise, there is not much character development. Writer Merian C. Cooper first had the vision of a tower ape climbing the buildings of New York City and worked the story out backwards from there. It is an action flick in the best sense; you never really even notice the lack of characterization because you are too busy watching people being flung to their deaths in tropical, dino-infested jungles! The filming was style was fairly straight forward, largely due to the then-inventive special effects technology used, but effective. 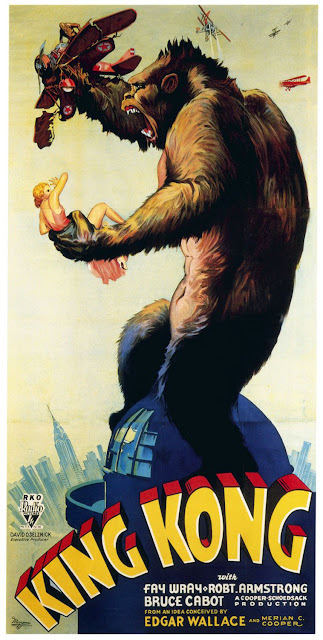 Released in 1933, it was also pre-code and if one watches the original release (King Kong was perhaps the first film that was re-released) you can see many of the racy scenes later cut from the film, including the leading lady, Fay Wray having her clothing peeled off by the ginormous ape. Poor Fay Wray; when sthe story's writer said she was getting the tallest and darkest leading man Hollywood had to offer, she thought she was getting Cary Grant! King Kong has earned his title though as the eighth wonder of the world, and, as a movie, his place at number forty-three on The American Film Institute's Top 100 Movies List. Though a remake in 2005 took Hollywood by storm, I'd recommend the original to all true movie fans. Long Live the King!